What is Sum of Year Depreciation? Sum of Year Depreciation (SYD) is a method of accelerated depreciation. Similarly to the double declining balanceDouble Declining Balance DepreciationThe double declining balance depreciation method is a form of accelerated depreciation that doubles the regular declining balance approach. It is frequently used to depreciate fixed assets more heavily in the early years, which allows the company to defer income taxes to later years. This guide will explain method, sum of year depreciation aims to depreciate a company’s assets at an accelerated rate. Companies may choose to do this as this practice will result in a bigger depreciation tax shieldTax ShieldA Tax Shield is an allowable deduction from taxable income that results in a reduction of taxes owed. The value of these shields depends on the effective tax rate for the corporation or individual. Common expenses that are deductible include depreciation, amortization, mortgage payments and interest expense in the first few years of the depreciation. Organizations that face difficult tax environments may choose to depreciate their assets in an accelerated way in order to realize larger tax savings and benefit from the overstated net income figure shown on the company’s financial statementsThree Financial StatementsThe three financial statements are the income statement, the balance sheet, and the statement of cash flows. These three core statements are intricately linked to each other and this guide will explain how they all fit together. By following the steps below you'll be able to connect the three statements on your own.. The sum of year method of depreciation is also popular with firms that are looking to write off equipment that has a high chance of becoming obsolete before the salvage valueSalvage ValueSalvage value is the estimated amount that an asset is worth at the end of its useful life. Salvage value is also known as scrap value or residual value, and is used in calculating depreciation expense. The value depends on how long the company expects to use the asset and how hard the asset is used. For example, if a is reached. For example, a company may choose this method to depreciate assets such as computers, which may become obsolete very quickly given the rate of technological advancements in the world today. 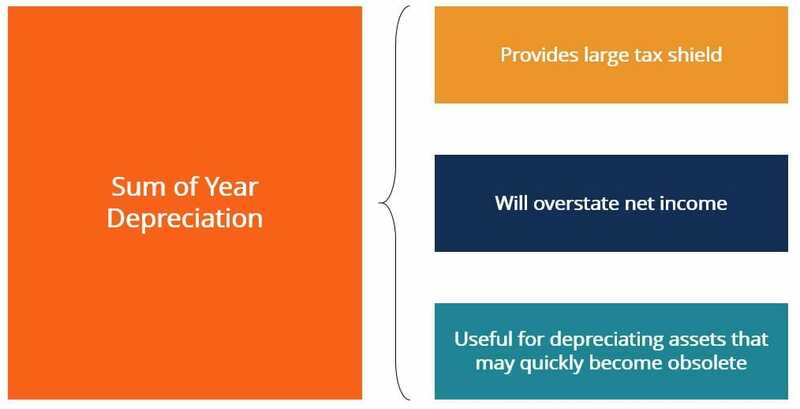 How does sum of year depreciation work? The sum of year depreciation method works by depreciating the asset’s depreciable amount by a depreciation factor unique to each year. The depreciable amount is equal to the asset’s total acquisition cost less the asset’s salvage value. The total acquisition cost refers to the total capital expenditure that the company had to undertake in order to gain possession of said assets. Consider coffee company Mega Coffee, which is ready to expand into its new office headquarters. The company is considering investing in the latest available computers in order to make sure that its business runs smoothly. The material cost of all the computers is $2,500,000. However, Mega Coffee has to pay $100,000 in shipping costs in order to move this massive order of computers across the country in due time. In addition to this, Mega Coffee is faced with a $100,000 installation charge to ensure that its computers are installed correctly and function at full capacity. Mega Coffee believes that at the end of the computers’ 5-year useful life, they will be worth $200,000. The company decides to depreciate these assets using the SYD method as it faces a fairly harsh tax environment, and because there is a chance that the computers becoming obsolete before their useful life is up. Create a depreciation schedule to model how these assets can be depreciated. Notice how the depreciation expense in year 1 ($966,667) is about five times greater than the depreciation expense in year 5 ($193,333). Thus, if the computers were to become obsolete after year 3, a huge part of their value would have already been depreciated. This means that the company would have already realized most of the tax benefits associated with depreciation, and thus would be more inclined to invest in more advanced technology. Accumulated DepreciationAccumulated DepreciationAccumulated depreciation is the total amount of depreciation expense allocated to a specific asset since the asset was put into use. It is a contra-asset account – a negative asset account that offsets the balance in the asset account it is normally associated with.